Getting to Aird is easy. Although Skye is an island in the north west of the Scottish Highlands a modern communications network ensures you can be here from any part of the UK in less than a day. Inverness is the nearest major airport and is only just over two hours by car, bus or train. 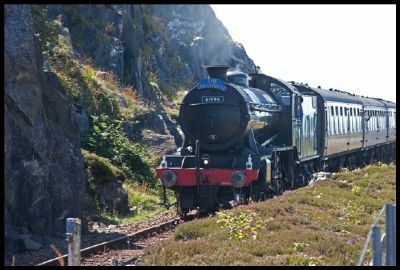 There is even a summer historic steam train service to Mallaig from Fort William which connects with the ferry service to Armadale. Alternatively the regular train service from Inverness to the Kyle of Lochalsh is often referred to as one of the 'great railway journeys of the world'. Here are some of the ways to get to Aird. Inverness is Skye's nearest airport, approximately 100 miles from Sleat. There are daily services to and from a number of UK airports, including, Gatwick, Luton, Birmingham, Bristol, Stornoway, Manchester and Southampton. There are also a number of international flights, some of which are for the summer season only. Click here for a full timetable of services. As an alternative to Inverness frequent services operate to and from Glasgow and Edinburgh airports, both of which are around 5 hours drive from Sleat. Major airlines operating to Inverness are Flybe, Easyjet and Ryanair, and Heathrow with British Airways. Skye is served by major trunk roads from the major cities of Scotland and is connected to the rest of the Highlands by the Skye Bridge, which is located at the Kyle of Lochash. From the south and central Scotland there are a number of routes, all of which connect to the A87 near Cluanie Dam. Follow this road through Kyle, Kyleakin towards Broadford, prior to which is the junction with the A851 which is the main road through Sleat, and which has recently been fully upgraded for most of its route. From the north of Scotland and Inverness Skye can be reached by the A82 from the north via Loch Ness and joining with the A87 at Cluanie or as an alternative from the north west coast via Achnasheen and Strathcarron on the A890 towards Kyle. To help you plan your road journey to Sleat, click here for the AA Route Planner Service. Scotland has frequent train services to the west coast, operated by Scotrail. The routes from Inverness to Kyle and from Fort William to Mallaig pass through some of Scotland's finest and most majestic scenery, and offer a unique experience, renowned as two of the great railway journeys of the world. Click here for timetable details. If you have a little more time and want a relaxed train journey north the Serco Scotland operate the nightly Caledonian Sleeper services from London Euston to Inverness, (with connections to Kyle) and London Euston to Fort William, (with connections to Mallaig). Bookings can be made up to three months in advance. Please see the Scotrail website for full information on these great ways to get to Skye. Car hire is available at locations in both Kyle and Mallaig should you want to come to Skye by train. If you are a train enthusiast then during the summer months the unique 'Jacobite' steam train services operates a daily round trip run from Fort William to Mallaig. Here you can step back in time, and enjoy trains as they used to be. The service is very popular and early booking is recommended. Full details are on the Jacobite website. The auld saying 'over the sea to Skye' has been used as long as anybody can remember and Skye is well served by two great services. These are in great contrast to each other with the famous CalMac ferry service from Mallaig to Armadale, in the south of Sleat to the romantic Skye Ferry, operating from Glenelg to Kylerhea towards the north. Cal-Mac offers up to 8 services a day during the summer season with reduced crossings on Sundays, and generally during the winter there are 2 services Monday to Saturday and there is a Sunday service late afternoon. 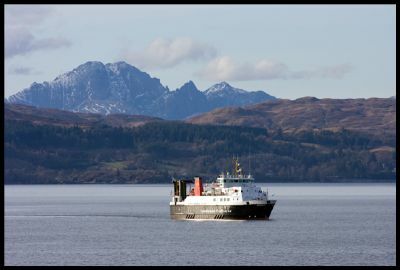 The crossing from Mallaig to Armadale takes 30 minutes across the Sound of Sleat, and is famed for its wonderful views to the Small Isles, Ardnamurchan, Knoydart and Skye. The waters abound with wildlife and there are frequent sightings of whales, dolphins and porpoises, together with numerous sea-birds. Many people coming to Skye use the unique Skye Ferry as an alternative to the Skye Bridge. This small six-vehicle ferry runs from Easter to October from Glenelg to Kylerhea, and is the last sea-going turntable operated ferry in the world. Glenelg is reached from Shiel Bridge on the A87 and passes through the beautiful Mam Ratagan, an alpine wonderland, before the road descends to the narrows of the Sound of Sleat. The ferry has starred in a number of Hollywood movies and TV programmes with the crossing taking just 5 minutes. Getting to Skye by coach couldn't be easier. Citylink operate frequent 'Citylink' services from Inverness, Glasgow and Fort William to Portree and Uig (for western isles sailings) via Kyle of Lochalsh and Broadford. Up to 3 services per day operate the routes in both directions with a variety of promotional fares. Sleat is served by reliable, but infrequent local bus services, Stagecoach on Skye, from Portree, Broadford and Kyle, most of which connect with the ferry services at Armadale. As with most rural areas in Scotland services are nothing like the cities so check your timetables first, especially if you are making ferry, train or coach connections. Traveline Scotland is a comprehensive website to help you plan your journey to Aird. Click here for all you need to know!